HJ: Dreams are a combination of messages and imagery originating in both the subconscious mind and higher realms of existence (astral plane) and therefore are very much worth remembering and learning to interpret, as they have many important insights and meanings for us if we are wise enough to listen, learn and understand. This article by the always venerable Judith Orloff is all about doing just that. Enjoy. Learn how to remember and interpret your Dreams. Dreaming is a direct line to a place where magic abounds and nothing is without meaning. It is a pristine state of awareness, unpolluted and clear. Direct guidance for healing lies in our dreams, the natural territory of intuition. Here, time and space are non-existent and anything is possible. Like a blank, white canvas, our dream world is a spacious medium where intuition can freely express itself. We have only to listen. Write a question on a piece of paper before you go to sleep. Formalize your request. Place it on a table beside your bed or under your pillow. In the morning do not wake up too fast. Stay under the covers for at least a few minutes remembering your dream. Luxuriate in a peaceful feeling between sleep and waking, what scientists call the hypnagogic state. Those initial moments provide a doorway. Open your eyes. 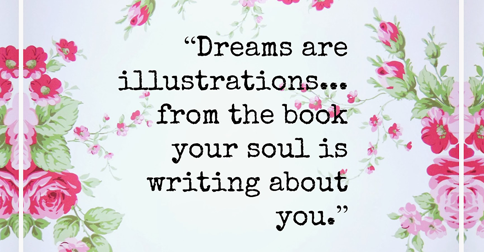 Write down your dream immediately; otherwise it will evaporate. You may recall a face, object, color, or scenario, feel an emotion. It doesn’t matter if it makes perfect sense-or if you retrieve a single image or many. Record everything you remember. Conversations with people you never met before who give instructions. I’ve found that my most dead-on intuitions either come across as compassionate or have no emotion at all. Develop a careful eye as you practice separating the content of your dreams from your reactions to it. Soon you’ll be able to tell the difference between unreliable guidance and truly reliable guidance. Be aware that your dreams go by different rules than your waking life. Get ready for a mind shift. Physical laws no longer apply. Gravity changes. In dreams you can fly!